Over 200,000 migrant workers reside in Singapore, often working undesirable jobs in hopes of obtaining the kind of life unattainable in their home countries. The sacrifice and hardships of these individuals are often overlooked and under-appreciated. We see men packed in lorries all the time, but are we truly conscious of their presence? That is the question the gallery show, Blind Spots is asking. 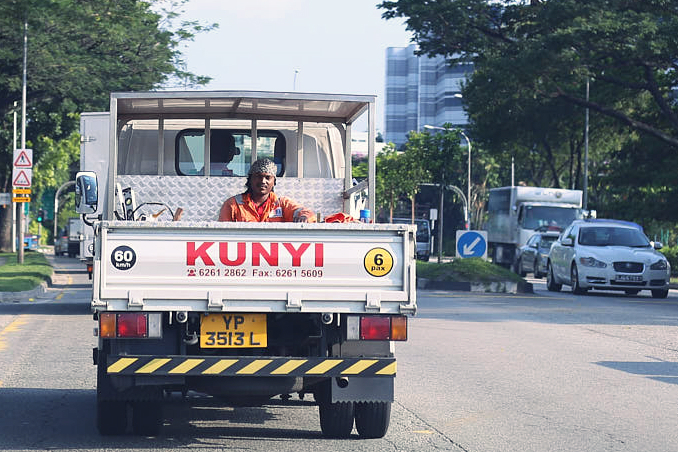 The exhibition highlights the experiences of migrant workers in Singapore. The show is hosted by Labour Arty, a non-profit determined to mend divisions and support other charity groups that help enhance the well-being of migrant workers. Many are drawn to Singapore for its cleanliness, safety, and opportunities. And while there are many of the latter found, the city is also fraught with danger and undesirable practices. There has been recent concern that many migrant workers are being denied fair wages and have little means for personal advocacy. Through visual and performing arts, Labour Arty shines the spotlight on migrant workers and hopes to shift our mindsets about them. This raw portrayal of everyday life forces intimacy between exhibition viewers and migrant workers. A representative from Labour Arty says, “These scenes are often seen but not noticed, and offer momentary glimpses of intimacy and interaction that are laid bare, though at times not by choice.” By forcing viewers to actively interact with the photos, the work is raising awareness for migrant workers. The producers of the exhibit hope to further increase the well-being of migrant workers and encourage acceptance and inclusivity. Open from July 20 to August 5, this free gallery show asks participants to check their own privileges and sympathise with an over-looked portion of the population. Blind Spots provides much needed prospective and intimacy within a stunning and intriguing show. Head to Objectif Gallery to see the show in person or head to their website.